jameco_electronics has no other items for sale. Exellent!! !....The item arrive and as described. Thanks. Just as I expected, beautiful piece. Flux was as described and shipment was prompt. Thank you! Very good product and easy to use. 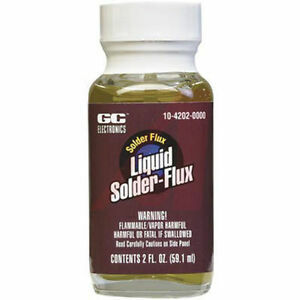 It makes solder go on better on small electrical wires. Easy to use with the built-in brush. A little dab goes a long way. Can also be used in needle applicator bottle. Use this stuff on 80 plus year old wiring and it works great. Works extremely well soldering / resoldering electronics including copper leads.